The Kohala region is divided into North Kohala and South Kohala. The western shoreline of this region is known as the Kohala Coast and is home to many posh oceanfront resorts and immaculate golf courses. North Kohala is centered around the former sugar plantation towns of Kapaau and Hawi. These small towns near the northern tip of the island still retain their picturesque old town charm and are home to numerous art galleries, interesting shops and boutiques, and welcoming cafes. One of the top attractions in Kapaau is the Statue of King Kamehameha I in front of the North Kohala Civic Center. Along the coast near Kapaau is Lapakahi State Historical Park where you can take a self-guided tour of an ancient Hawaiian fishing village. Nearby to Kapaau is the Birthplace of King Kamehameha I as well as Mookini Heiau, one of Hawaii’s largest and oldest heiau (sacred places of worship). The two historic sites are part of the Kohala Historical Sites State Monument. In South Kohala are the towns of Waimea and Kawaihae as well as the pristine Kohala Coast with its posh resorts and beautiful beaches. Waimea is a thriving town that is home to the Parker Ranch, Hawaii Preparatory Academy, and many fine shops and restaurants. Kawaihae is the site of Puukohola Heiau which is a huge stone structure built by King Kamehameha I, and also Kawaihae Harbor which is one of the Big Island’s major ports. Nearby is a popular white-sand beach at Spencer Beach Park which is well protected by a breakwater and offshore reef. Farther south along the Kohala Coast is Waikoloa Village which is situated on Anaehoomalu Bay and home to elegant resorts including Waikoloa Beach Resort and the Hilton Waikoloa Village. Golf is abundant in this region including the Waikoloa Village Course, the Waikoloa Beach Golf Course and the King’s Golf Golf Course. Also along the Kohala Coast is the resort town of Puako and lovely Puako Bay as well as the Puako Petroglyph Archaeological Preserve. Spectacular Hapuna Beach is located on the Kohala Coast next to the Hapuna Beach Prince Hotel and the Mauna Kea Beach Hotel. 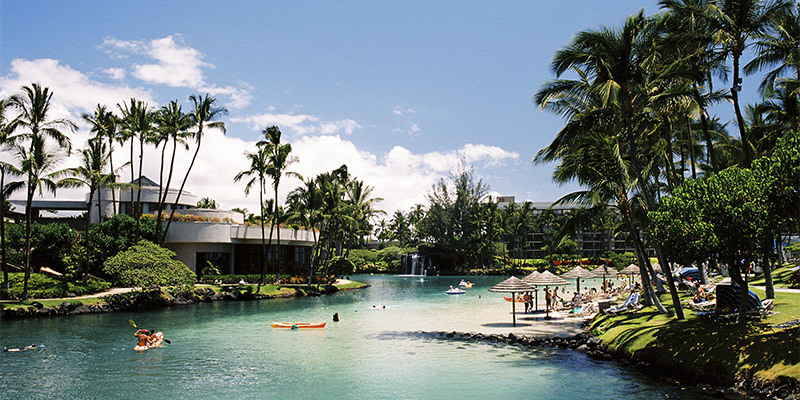 The Kohala Coast is often called the Gold Coast due to its many upscale resorts and developments set amidst the dramatic black and rust-red lava landscape created by Hualalai volcano lava flows centuries ago. The Kohala Coast spans from Kaupulehu and the Hualalai Resort north all the way to Mauna Kea Resort. The name Kohala by itself is often used by locals to refer to the region around the towns of Kapaau and Hawi, though Kohala also refers in a broader sense to the two county districts of North Kohala and South Kohala including the Kohala Coast. The Kohala region was named after Kohala volcano which is one of the five major volcanoes that formed the Big Island. Rainfall in Kohala varies widely from less than 5 inches (130 mm) along the shoreline near Kawaihae to more than 150 inches (3,800 mm) annually just 11 miles (18 km) away at the summit of Kohala Mountain. The varied terrain of Kohala provides opportunities for many outdoor activities including horseback riding, hiking, bicycling, and ATV tours. Water-based activities include swimming snorkeling, surfing, scuba diving, kayaking and fishing.